Disclosure: This post has been sponsored by Produce For Kids, but all thoughts and opinions are my own. Since I make it a priority to live a healthy lifestyle, one of my biggest passions in life is passing on a healthy eating traditions to the next generation. I love coming up with simple, fun, and tasty lunch ideas that myself and my toddler would love. With back to school coming up, I’ve partnered with Produce For Kids’ Power Your Lunchbox Pledge campaign to inspire and create a healthy and fun lunchbox idea! The Power Your Lunchbox Pledge is a program kicking off today that Produce For Kids and their partners will collectively make a $1 donation for every pledge made online to Feeding America, helping feed families in need. To make the pledge, all you have to do is fill out this quick and simple online form pledging to eat healthier lunches for your family. That’s it! And with that, you can help raise money for the non-profit Feeding America. 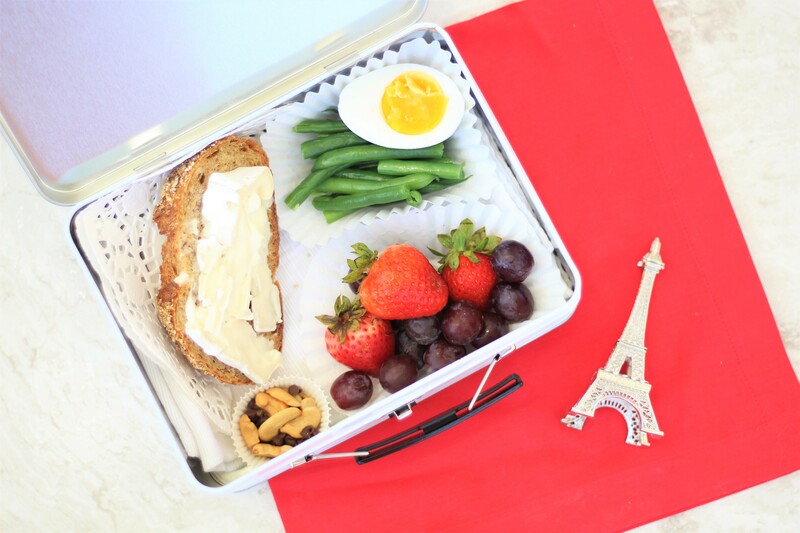 I’m taking the pledge to eat healthy lunches along with my family, and to kick off our healthiest back to school time yet, I made a lunchbox inspired by my favorite place to visit: France! French food is my favorite food, and making a lunchbox with a little French flair instantly puts my in a good mood and reminisce about happy memories. What better thing to include a lunch you’re taking to work or school? To make soft boiled eggs, place eggs in a pot with water and a dash of salt and grapeseed oil. Bring to a boil for five minutes, then drain and run under gold water. To make the green beans, place green beans in a vegetable steamer and steam for 15-20 minutes. TIP: Make about 4-5 servings of the green beans and eggs at the beginning of the week, then pack them all week long! Spread a little amount of brie or other cheese on a thin whole grain bread slice. Pack strawberries and grapes, and in a mini muffin liner place a mix of cashews and cocoa nibs for a simple dessert. You can find even more healthy eating lunchbox ideas from Produce For Kids on their site! So while you stop by to take the Power Your Lunchbox pledge, you can grab some great and easy healthy lunchbox ideas, too! Healthy Cove Bar Copycat Recipes – 3 Ways!